Is TARV a seasonal problem? The 719 submissions from March 2010 to May 2018 consisted of a total of 926 samples of tendon. There was no statistical evidence that TARV diagnostic submissions were seasonal, although positive submissions were higher in January, April, July, and December. Our studies have demonstrated that inoculated poults can transmit the infection laterally to pen mates, likely through manure. It is generally believed that TARV can be egg transmitted from breeders to offspring although no study is available that has tackled this issue. However, egg transmission of chicken arthritis reovirus (CARV) has been well documented and has been effectively controlled by vaccination of broiler breeder flocks. Our industry partners have shown that, in some instances, intramuscular vaccination with autogenous, killed TARV can reduce onset of lameness in offspring, but vaccination has not been 100% effective. Vaccination failure might be a result of antigenic changes in the virus as it passes through a flock. In 2017, MVDL received 268 cases from 11 different states of which 169 (63%) were positive for TARV by virus isolation. In the first six months of 2018, we received 130 cases from eight different turkey producing states of which 65 (50%) were found positive for TARV. One of the burning questions is: Does the virus infect at an early poult stage and then later localize in tendons at an advanced age? The age susceptibility of chickens to CARV has been well documented, but similar studies are lacking in turkeys because of the novel nature of the virus. We have requested MTRPC to support this study because the results of this study will help us understand at which age the birds become susceptible to TARV infection and how long does it take to produce tenosynovitis at various ages. These data can then be used to develop appropriate control methods. During the last one year, we have made considerable progress towards whole genome sequencing of TARV isolates (using RARF funds). Based on analysis of whole genome sequences of 93 isolates (87 TARV and 6 TERV) from 2011-2018, we found that different states or different submitters/flocks do not have distinct viruses; rather they share common viruses. However, variation based on temporal data was observed. Also, based on M2 (µB) gene, three different genetic clusters of TARV were observed (Fig. 1). In silico epitope mapping indicates that these three M2 based genetic clusters, fortuitously, overlap with epitope mapping. Serotyping data by Dr Jack Rosenberger (Aviserve, Newark, DE) indicate that at least three serotypes of turkey reoviruses are present. These observations strongly support that M2 could be a major serotype determinant. These observation suggest that, in theory, we can select three isolates (one from each cluster) and that a multivalent vaccine based on these three isolates should be protective against a large majority of currently circulating TARVs. Fig. 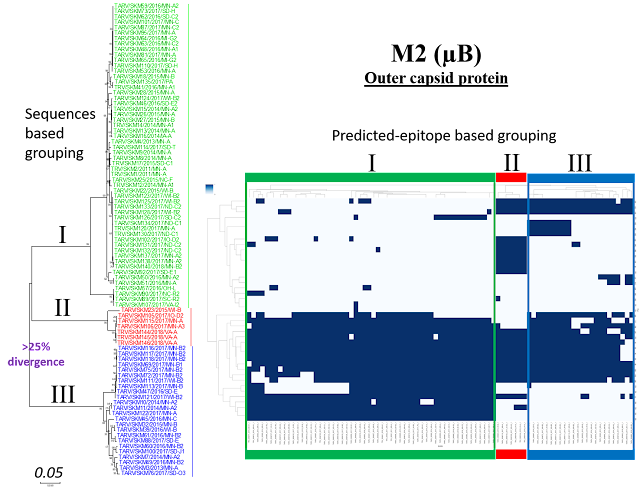 1: Phylogenetic and cluster maps based on M2 sequence indicating genetic (left) and antigenic (right) relationships of TARV isolates. The isolates in phylogenetic clade I, II and III were also found to have distinct epitopic patterns on the epitope map. What should I send the veterinary diagnostic laboratory if I suspect turkey reoviral arthritis? Dr. Rob Porter, Minnesota Veterinary Diagnostic Laboratory (612) 624-7400 or by email porte349@umn.edu. Dr. Sunil Mor, Minnesota Veterinary Diagnostic Laboratory (612) 624-3698 or by email kumars@umn.edu.